This figure appears about a third of the way into Triadic memories. It catches my attention, wakes me up: it is a signal that something is changing. Where are we going now? And haven’t I heard this before somewhere? The chords vary, hovering around a few distinct profiles that recur with variations in pitch and register. Each two-measure unit repeats. 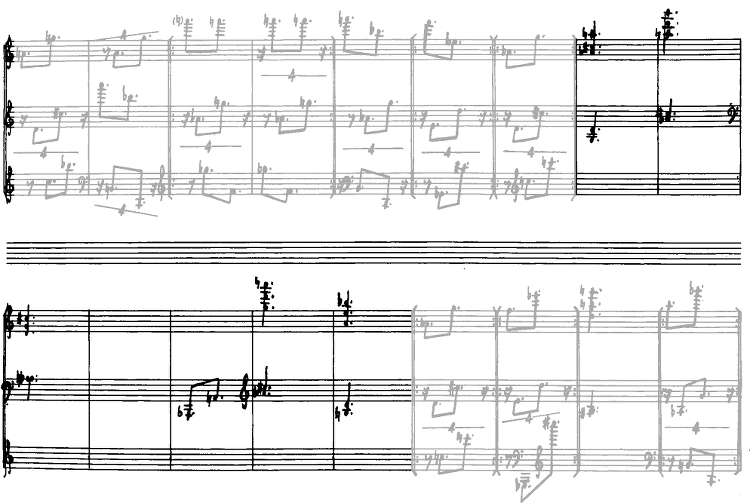 In the first part of the passage (Example 2, above), the images alternate between two and three repetitions each, but in the second part (Example 3, below), the repetitions increase by one with each instance: two times, then three times, then four times, up to nine times. The compositional cause and the musical effect of this six minutes of music is a deep concentration on the musical image. By the time I get to the nine-fold repetition, I am still and alert to subtle variations in the imagery at various time scales: the differences between each pair of chords and the next, between this version of the chords and my memory of the others that have occurred before, and the fine differences between the individual repetitions themselves. This deepening of musical concentration is typical in late Feldman, and the places where it happens are among the most beautiful of all his work. This is not just my concentration: it is also Feldman’s concentration. Triadic memories, like all the late Feldman works, is not so much like a work of architecture as it is a journal: a record of a journey in sound (external) and mind (internal). Triadic memories was written from front to back, and when he got to this place in the piece, Feldman found this image and became immersed in it. His concentration deepened. I can see him at the piano, finding each set of chords, repeating them over and over, for longer and longer periods of time. And then, out of the blue, the two grace-note chords appear: a bell, a clear signal that stands out from the silence of what has been going on. Feldman has broken off his focus; my own concentration is broken. Why does this happen? The chord itself is new, outside the musical world I’ve been immersed in. The grace notes change the rhythmic profile. The chord is repeated, thus breaking up the swaying movement of the phrases I’ve become accustomed to. And its repetition comes after an extra measure of silence: I have to wait to find out what’s next. The psychological significance of this simple repeated grace-note figure can only be understood by looking at what came before. But it is not as if Feldman planned this—it just happened that his mind moved on and he rang this bell. The chord doesn’t draw attention to itself here. It is happening in a part of the piece that is not so stable, where the imagery shifts often. 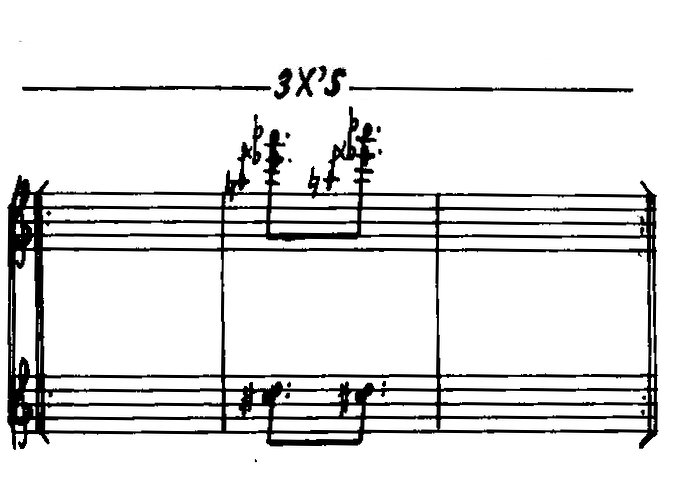 This section, from measure 188 through 252 (the section just before the concentrated part described above), includes an exploration of chords that evolve into the grace-note chord. 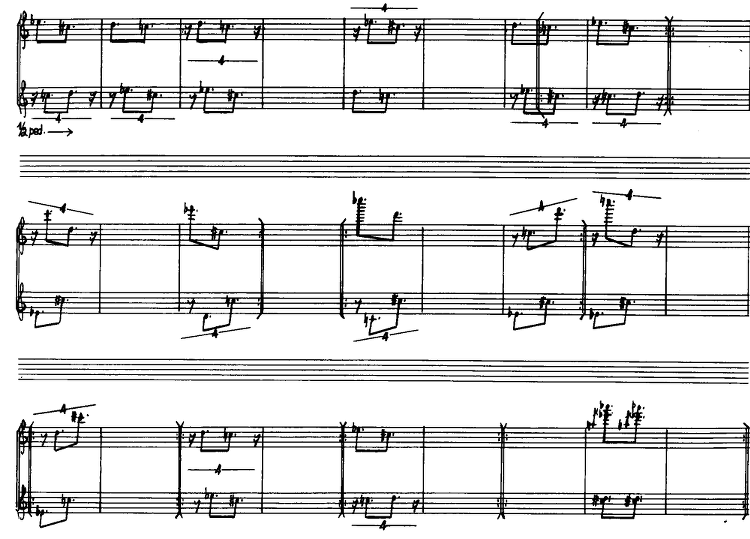 Here Feldman followed a different kind of musical thought process: playing a chord, listening to it, responding with a revoicing, a movement to a different register, a slight tweak of a note up or down. This evolution of the grace-note chord took place about ten minutes before its striking reappearance and repetition broke off my concentration. Touched upon within a context of change and uncertainty (where does this chord belong? ), it did not stand out as a distinct musical image then: it was only seen in passing. But when it comes to mind—that is, when it came to Feldman’s mind—at m. 314, repeated, it acquires an identity that gets firmly placed in my memory and will persist in this form. Its future appearances are momentary; they have less dramatic presence. 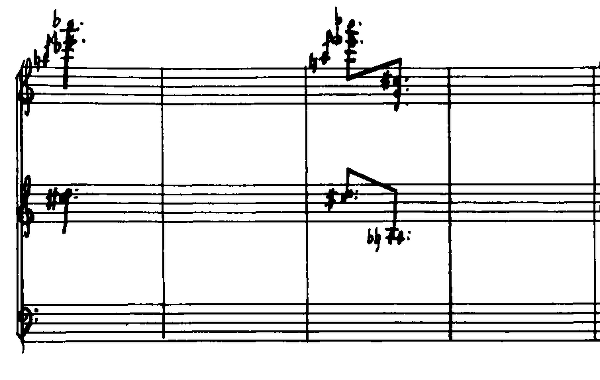 For example, at the top of the next page, Feldman starts a completely new pattern, but before fully settling into it, after just 24 measures, the grace-note chord figure appears again. Here it is a smaller interruption, like pausing to look over one’s shoulder at where one came from, to get one’s bearings after wandering a bit. The music moves in a different direction after this, and the grace-note figure is not heard from again for a considerable time, over ten minutes. It makes a quick appearance in a new context, minus the repeat signs and surrounding silences, like a fleeting memory that passes unacknowledged. Note: Audio examples are taken from Aki Takahashi’s recording of Triadic memories.